William’s lineage is not clear - there is no trace of his early years. We do know that by the time he married a vicar’s daughter, Ann Hayward, in Uley, Gloucestershire in 1774, he was already a Widower. William and Ann’s first child, also called William, was born in Southwark in 1776 but died only 5 months old. Interestingly, a Samuel Budd (potentially a cousin?) was also living in the same Parish, which could explain why William and Ann were also there. By the following year William and Ann are settled in Uxbridge, Middlesex. They went on to have 12 children in all (Edward, one of the children, later in life cites 16 children being born but only 12 can be traced). The lives of these children are set out on the pages that follow. Edward, his son, describes his father as being ‘a fine example of Saxon blood - a powerful man of liberal and gentlemanly character'. What may be derived of William’s life is a fascinating insight into the Georgian times, and also into the man’s character and ambitions for his children. This was the era when patronage and connections were everything - William wasted no time in getting the best for his children through these routes, although his own life was to be less fortunate. By 1784, mention is made of the Budd children being baptised in nearby Great Missenden (although all their christenings are entered into the register of St Mary’s Uxbridge). In 1785 William is cited as attempting to sell an Inn that he then owned, the White Hart Inn, in Great Missenden, “with stabling for 28 horses, sundry outbuildings and a garden”. With five and a half years to run on the lease, he is unsuccessful in his attempt to sell the property, and moves when the lease expires in 1791 to take over the Crown Inn, in Uxbridge (this perhaps explains the retrospective entries into the Parish Register of the earlier christenings). Although the exact circumstances are unknown, it is perhaps the case that William over-extended himself financially in the refurbishment of the Crown Inn, because in July 1799, he is declared Bankrupt at the Guildhall Courts in London, and is forced to sell the by then named Crown and Cushion Inn in August of that year. From then on, it would appear that William is forced to rely upon his children for support. It is worth pointing out how well established some of his children became, in no small part, due to William’s efforts to gain patronage and connection. William’s later years are hard to chart with any certainty. A William Budd appears in Studley in 1801, shortly after the Uxbridge Bankruptcy, as Gamekeeper to Benedict John Angell (Ann’s, William’s eldest daughter’s, husband). I think this is our William. Record of William the Gamekeeper persist until 1812. I think Ann took in William, his wife Ann and their four dependent children (George, 14, Charles, 12, Richard, 10, and Samuel, 9) in 1801 (he appears as living in Uxbridge until 1800). Indeed to perhaps shore up this hypothesis, Samuel, when applying to rejoin the Army in 1828, gives his address for the prior 5 years as Rumsey House (where Ann and BJ Angell lived). I think Samuel grew up there and came home from the Army there in 1815, where his parents were still living. William’s death is recorded at Rumsey Cottage (a property owned by his son-in-law, Benedict John Angell) in 1821 as having taken place on 21st January ‘...after a severe and long illness which he bore with christian fortitude. He is buried in the nearby church at Bremhill. Ann's death is reported in Studley, Calne on Tuesday 8th February 1825 - she was buried alongside her husband in Bremhill church. Neither gravestones survive. 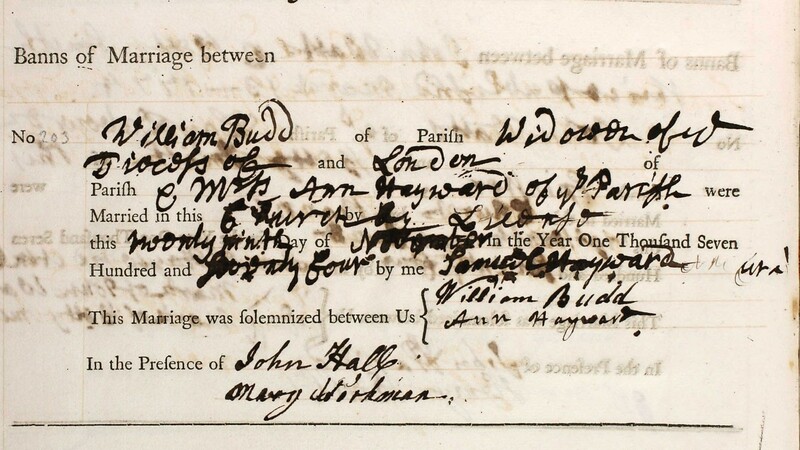 William and Ann's Marriage certificate dated 29 Nov 1774, indicating Wm as a Widower. Samuel Hayward, Ann's father married the couple.